Survive and thrive in today's economy! With over 1,100 episodes in this Monday-Friday podcast, business and investment guru Jason Hartman interviews top-tier guests, bestselling authors and financial experts including; Steve Forbes (Freedom Manifesto), Tomas Sowell (Housing Boom and Bust), Noam Chomsky (Manufacturing Consent), Jenny Craig (Health & Fitness CEO), Jim Cramer (Mad Money), Harvey Mackay (Swim With The Sharks & Get Your Foot in the Door), Todd Akin (Former US Congressman), William D. Cohan ( The Price of Silence, The Last Tycoon, & House of Cards), G. Edward Griffin (The Creature from Jekyll Island), Daniel Pink (National Geographic). 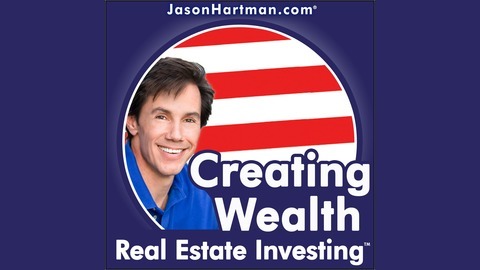 Jason Hartman is the Founder and CEO of Platinum Properties Investor Network, The Hartman Media Company, and The Jason Hartman Foundation. Starting with very little, Jason, while still in college at the age of 19, embarked on a career in real estate while brokering properties for clients, he was investing in he own portfolio along the way. Through creativity, persistence and hard work, he soon joined the ranks of the top one-percent of Realtors in the U.S. and in quick succession; earned a number of prestigious industry awards and became a young multi-millionaire. Jason purchased an Irvine, California real estate brokerage firm which he expanded dramatically and was later acquired by Coldwell Banker. He combined his dedication and business talents to become a successful entrepreneur, public speaker, author, and media personality. Over the years he developed his Complete Solution for Real Estate Investors™ where his innovative firm educates and assists investors in acquiring prudent investments nationwide for their portfolio. 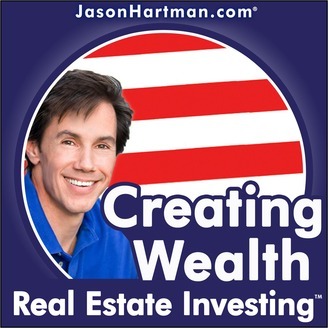 Jason’s highly sought after educational events, speaking engagements, and his ultra-hot “Creating Wealth Podcast” inspire and empower hundreds of thousands of people in 26 countries worldwide. Additional guests featured on the Creating Wealth podcast include Robert Kiyosaki (RIch Dad Poor Dad), Matthew Quirk (The 500 & The Directive), Eve Wright (Life at the Speed of Passion), John Lawrence Allen (Make Wall Street Pay You Back), Jerry Robinson (Bankruptcy in Our Nation), Peter Zeihan (The Accidental Superpower), David Crowe (National Association of Homebuilders NAHB), Consuelo Mack (PBS - Wealth Track), Sean Haugh (Libertarian Candidate for the US Senate), Scott Paul (Alliance for American Manufacturing), Charles Goyette (Ron Paul's America Show), Chris Martenson (Crash Course.